Show me someone who doesn’t appreciate Thee Oh Sees and I’ll show you a damned fool. Same with all the other name incarnations of the band: The Oh Sees, Oh Sees, and OCS. It’s almost like band head honcho John Dwyer doesn’t want his steps to be traced back. Or maybe he’s divvying up the band’s output under slightly different namesakes so that listeners can distinguish them. OCS definitely was a different approach to the band as it saw them making quieter, more acoustic, more adult-contemporary music. That didn’t last however, and neither did the name, and the follow-up is the phenomenal ORC. 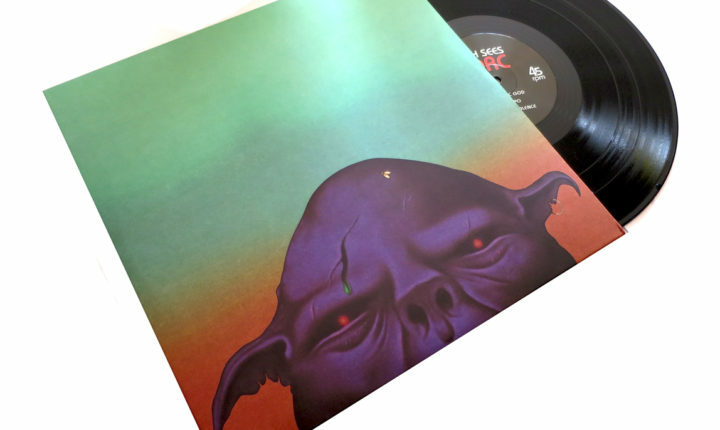 Right away I’d like to point out how the artwork can only best be appreciated with the vinyl release as I doubt anyone noticed the earring and the fly on the head of that goblin on the cover (or is that an ORC). Also, Oh Sees vinyl always comes in special printed sleeves, slightly rounded around the edges and spin at 45 RPM instead of 33 for that special audio boost. How the band can do this and still keep record prices so low, I’ll never know. And of course, this is not a band that’s shy about their musical output either. It’s not a question of whether Oh Sees will put out a record every year, it’s more a question of how many. Lord knows where Dwyer has found his fountain of inspiration, but I’d like to drink out of it, if he doesn’t mind. And that doesn’t mean Oh Sees sound stale. Not at all. The band has somehow managed to both keep their sound recognizable and fresh throughout the years. I just wish they’d pump the brakes a bit and give me some time to digest their releases and think back on them instead of tempting me with new music all the time. Sonically, ORC is a continuation of the band’s sound into the stratosphere. While their previous electric album A Weird Exits saw them cruising at interstellar altitudes, enjoying the sights, ORC sees them blasting off at full speed to their next destination, whatever that may be. If the previews of Smote Reverser [which is slated to be the title of the band’s next album -ed] are any sign, it seems like the band will run into some dangerous adversaries which they will be battling before continuing their journey. For those of you who appreciate more concrete interpretations, I’ll just say that ORC has that psychedelic Oh Sees sound with a heavy dose of rock to propel it. The band sounds true to form, focused, ingenious, and with no signs of slowing down. Stay the course, my friends. We’re all in for this journey.